HÀ NỘI – President Trần Đại Quang met with Vietnamese and foreign scientists in Hà Nội yesterday after they attended the seminar themed “Science for development” in the central province of Bình Định’s Quy Nhơn City on Wednesday and Thursday. The event was part of the “Meet Việt Nam” programme on the occasion of its 25th founding anniversary. The President thanked scientists, politicians, policymakers and corporate executives for actively joining the activities of the programme, which is a bridge connecting Vietnamese and foreign scientists, making important contributions to Việt Nam’s scientific and education activities. The Vietnamese Party and State always focus on science and education development, considering it the top national policy and a driving force of the country’s sustainable development, he said. The President praised Bình Định Province for supporting the association and putting into operation the International Centre for Interdisciplinary Science and Education since 2013, turning the locality into a destination for annual meetings of domestic and foreign scientists. He recalled an experience in June 2016 when he visited the centre and expressed his appreciation for the helpful contributions of the association, Prof. Trần Thanh Vân and his spouse Prof. Lê Kim Ngọc. The leader expressed hope that ministries and agencies will continue partnering with the province and the association to develop the centre in service of science and education not only in the province, but also across the central provinces and the entire nation. He also asked foreign scientists to continue supporting the programme and assisting Việt Nam in science and education for the country’s sustainable socio-economic development. 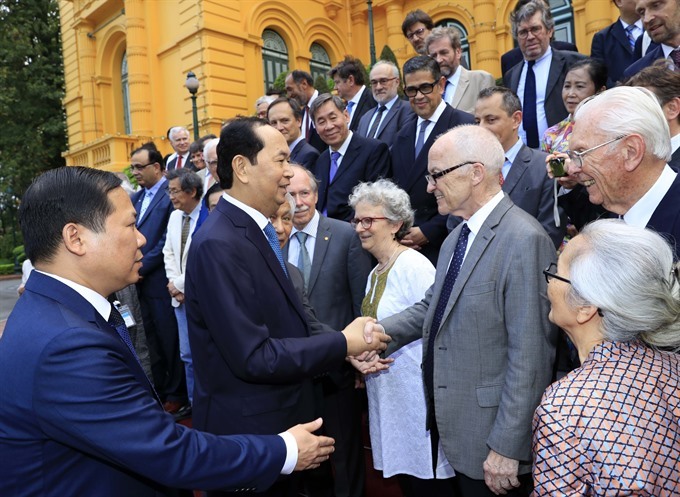 The 14th “Meet Việt Nam” attracted 55 foreign scientists and other delegates, including two Nobel laureates in physics and economics, popularising the image of Việt Nam and its people to international friends. Over the past 25 years, Meet Việt Nam, initiated by Prof. Vân and Prof. Ngọc, has attracted thousands of well-known scientists, including Nobel, Fields and Kavil laureates.